Your say: Is Obama green enough? 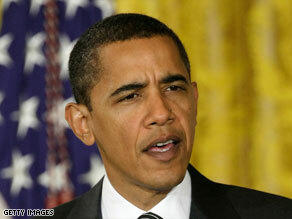 What do you think of U.S. President Obama's green policies? Does the stimulus bill do enough to encourage green jobs? (CNN) -- It seems that saving the U.S. economy, and greening America, is going to take a staggering amount of money. The economic stimulus bill will have a number of green components. The $787 billion-plus economic stimulus bill to revive the ailing U.S. economy has earmarked a large amount of money to green projects, a step toward a green economy and the "green collar jobs" often mentioned during the Obama election campaign. Advocates of large-scale green projects maintain that investing in them rather than traditional infrastructure will reap bigger dividends to the environment and individuals. In defending the stimulus bill, Obama said: "I don't care whether you're driving a hybrid or an SUV -- if you're headed for a cliff, you've got to change direction." But will the bill and the Obama administration be able to steer us in the right direction and negate the effects of climate change? In an executive order at the end of January he allowed 14 states to set their own vehicle emissions standards, as well as announcing new regulations requiring improved fuel efficiency. Obama may be making his mark on U.S. green policy, but as the stimulus bill is making its way through the U.S. Senate this week, with a vote expected on Tuesday February 11, the spending on some green programs has been cut. A $7 billion fund for energy efficient federal building has been halved to $3.5 billion; an $800 million Environmental Protection Agency Superfund has been reduced to $200 million, and $1 billion for Energy Loan Guarantees has been cut altogether. Many of the green projects touted in the stimulus bill highlight energy efficiency -- from small-scale home retrofitting to large-scale solar farm projects and a new "smart power grid." There are also a number of means for apportioning the money, from grants to tax cuts and loan guarantees. But do these projects go far enough? Is it enough to fund projects, or maybe you think more should be done to encourage private investment? Have your say, use the Sound Off box at the bottom of the page and tell us what you think about Obama's green policies.